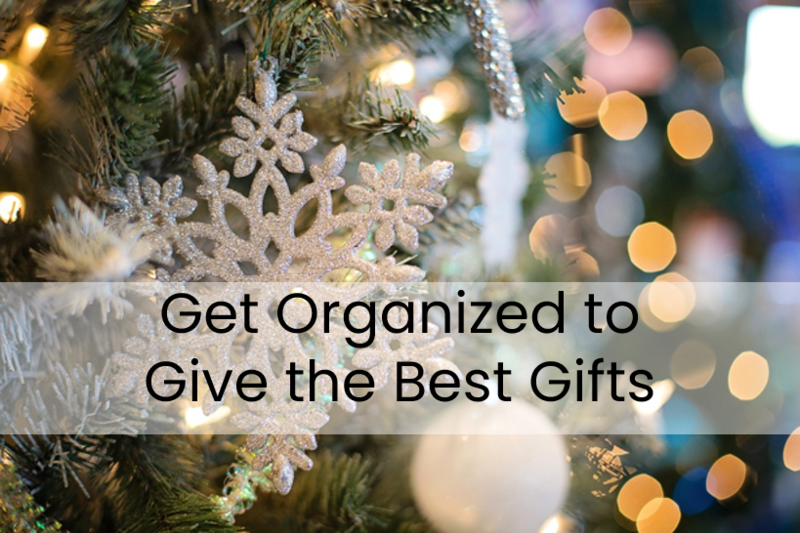 I think we all want to give the best gifts during the holidays, but doing so can sometimes be a challenge. Limited time and resources can prevent us from achieving this worthy goal. The way to surpass these obstacles is to plan ahead. For the first twenty years of my marriage I struggled to surprise my husband. Every time I bought him a gift, he would guess what it was before I could give it to him. I felt like a failure at gift giving. Then I started listening (and taking notes). When we are out shopping and he sees something he really likes, I make a mental note. I do the same thing at home when he comments on something he needs or something he thinks would be nice to have. Then quick as I can (so I don’t forget it), I write it down. I do the same for other family members as well. You can obviously write your notes on paper or you could use any shopping app or note taking app to record your gift giving inspiration. My preferred method for recording such information is a free shopping app called Grocery IQ. It allows me to create different shopping lists. I have one titled ‘gifts’ which I use for storing my inspiration. I like using an app because I always have my phone with me when I’m shopping which makes it easy to access my list. When you are out shopping, and you think to yourself “________ would love this”, buy it! Especially if it’s on sale or it’s a one-of-a-kind item. It doesn’t matter if it’s February. They will still love it in December, and you will love the luxury of spreading the expense of holiday gift giving out over the course of the year. Inventories rotate and deals pass. Not acting when you see a great deal on the perfect gift can cost you in the long run. It may mean spending more for the same item later, or worse, the item might not be available when you go looking for it again. Give the best gifts by getting gifts when you see them so you don’t miss out. If you have an ongoing, regularly updated list of things the people you buy for really want or need, you can begin to keep an eye out for good deals on those items. We always buy each of our kids a Christmas ornament each year. Last December my husband found the perfect Christmas ornament for our oldest daughter for 50% off at an after-Christmas sale. We snatched it up and set it aside. Then in early March I bought several sweaters and long sleeve shirts for my two sons on clearance and set them aside. I paid $8-$10 for items that normally cost $50-$60. Because I was able to get really nice things for a fraction of their normal cost, the expense easily fit within my monthly budget. There are certain times of the year (usually around holidays) when sales are consistent. Plan ahead to do your shopping in spurts throughout the year during holiday sales, so you can save and give the best gifts at the same time! Spreading purchases out over the course of the year not only saves money; it also prevents ‘settling’ for something last minute because time is running out. The best gifts come from the heart, and a great way to put your heart into something is to make it yourself. The beauty in making a gift is the thought and care that goes into the effort. Sometimes this means more than the gift itself. Gifts don’t have to be crafty to be homemade, although that is certainly a great option. If you are a good cook or baker you can always prepare an edible gift. For those who are gifted at writing you can compose something such as a poem, short story or play. A musically talented friend of mine made CDs of herself playing her favorite hymns on the piano. It was beautiful. If you’re really a gifted musician you could compose and record a song for someone you love. So-called homemade gifts don’t have to be made at all. They could simply be offered. By this I mean giving of yourself. One way to do this is by offering service of some kind (babysitting, yardwork, a backrub, etc.). Another way to give of yourself is to pledge your time to the recipient. This could involve anything from bowling to board games. The idea is simply to spend time together doing something you both love. It's easier than you might think to give the best gifts. Doing so offers rewards to the giver as well as the receiver. There is something truly magical about making someone you love happy. The secret to success is planning mingled with a bit of ingenuity. May you have joy in planning and organizing your gift giving efforts. If you liked this page, please share it on social media. Please leave me a quick comment as well in the section below. I'd love to hear from you!